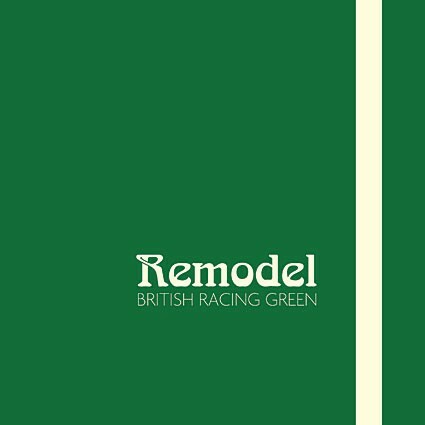 Remodel released the single ‘British Racing Green’. It is one of the most innovative yet addictive songs in their catalogue. Intentists are always interested in the creative process or ‘creative trail’ of a work of art. Today we are looking at this journey. The front cover (below) referenced the nose cone of a 1960s racing car. Let’s focus in on one of your artworks in particular. Could you share some of the thoughts behind this work? MARK: The song I spoke of before; British Racing Green. (B.R.G.) It’s a song based on a quite ‘Kraftwerk-like’ idea. Disonant verses are meant to represent tension and racing, with you being lifted away by the chorus. Before writing, I called my dad for research, building a vocal’s bank to dip into for lyrical inspiration, depth. Moreover, the artwork on the sleeve is an attemptto capture the livery(?) of 1960’s F1 cars with its colour and stripe. LEIGH: The song is accumulative: speed and tension increase from the start through the first verse, first chorus, second verse and to the climatic ending. The latest recording shows the development of extra instrumentation, voices and noises to bring more intensity, ‘colours’, and character to the song’s ultimate crescendo. We are much happier with the current recording (2011) of B.R.G than we were with the first. Previous Focus on an Intentist: Week 3, Day 3: Rare interview with Remodel!